According to the desk person at the Budget rental truck return counter I transported the three motorcycles 2,700 miles including the stop in Milwaukee for my 40th high school reunion. 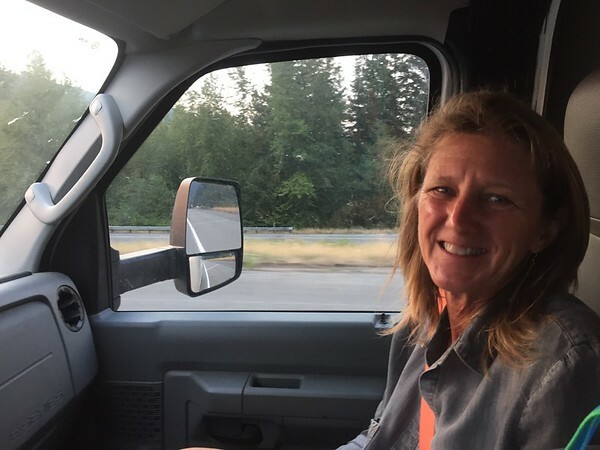 Deby was great help taking turns driving the 16 foot monster across the Great Plains. 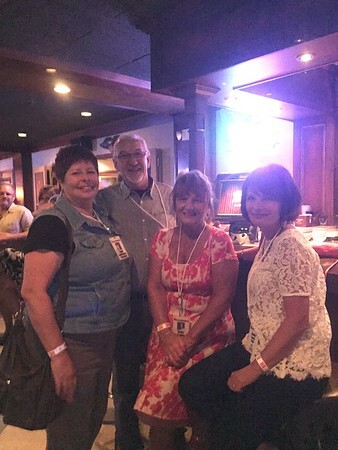 The reunion was a blast, I even connected with some old friends from the 5th grade! Great to see you Sandra, Betty and Debbie! 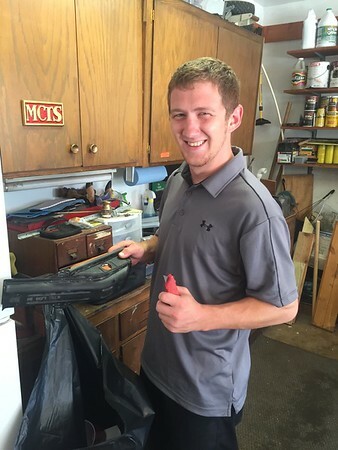 While in Milwaukee we stayed with my brother and his wife (thanks guys) and took time for some last minute motorcycle maintenance, adding pre-filters to the KTM and drilling some holes in the air boxes to help the big 690s breathe a little easier. Now that the bikes were ready to go we had one more bit of preparation to complete. Buzz cuts all around thanks to niece Julie. The kids loved it, quite a spectacle. A little fine tuning. Clean buzz cuts and ready to go. Monday morning we left Milwaukee early to drop Deby off at the airport to fly home and the boys and I headed south to Knoxville, a 700 mile 14 hour drive. We arrived after 9:00 PM and checked into a Holiday Inn. Jon allowed this one night at a hotel because we hadn’t officially started the TAT ride. Hungry and more than a little thirsty the front desk directed to us to a place called Twin Peaks where we could get a beer and some food. It took me a minute after I walked in and saw the servers why they call it Twin Peaks. I had a house beer called a Dirty Blond that actually tasted pretty good. Of course after driving 14 hours anything cold would have been excellent. Tuesday morning after our free gut bomb breakfast we drove the couple of miles to the Budget truck rental place. 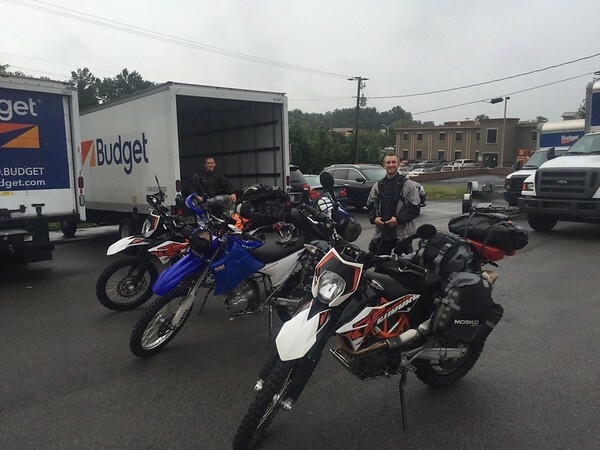 It had been raining all night and continued as we unloaded the bikes. 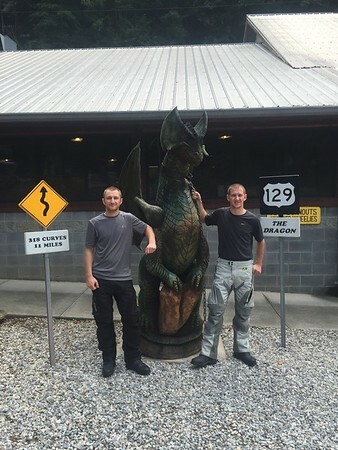 Eventually we got everything sorted out and found ourselves riding south on route 129 on our way to Deals Gap and the Dragon’s Tail. 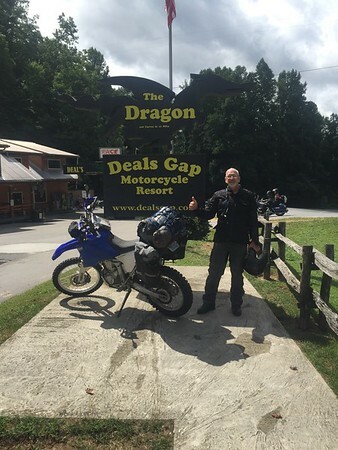 For those who don’t know Deal’s Gap is a famous motorcycle road with 318 turns in 11 miles. People come from all over the country to tame the dragon. http://tailofthedragon.com/ We hit the north part of the dragon about 11:00 AM, it was off and on raining so the road was mostly wet. The good news was that it was early on a weekday and with the wet roads we mostly had the route to ourselves. We fell in behind three sport bikes who were ready to burn up the road. I let Jon and Weston get in front of me and off we went. The boys tore off after the sport bikes and easily kept right up. I cranked up the 250cc Yamaha and strangely enough managed to mostly keep up. I will say we managed to keep up a pace much faster than I did riding a Harley Ultra a few years ago with Deby on the back. At the end we had to buy stickers and take the obligatory pictures. 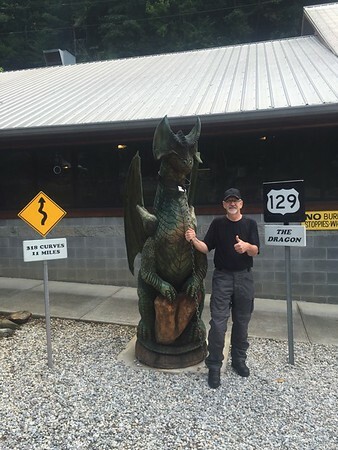 After the Dragon we continued to Tellico Planes, the official start of the Trans American Trail where we had lunch at the TelliCafe and stopped at the grocery store for provisions before leaving the pavement. The rain continued of and on all day but it was warm and we were prepared so it wasn’t much of a problem. Once the pavement turned to gravel we were warned of three water crossings with the third one being the most difficult. With all the rain we came to the first crossing and the water was running high and fast. We thought about stopping and walking across when Weston just went full speed. Weston made it across just fine even though the water was above his axles but when he got to the other side his bike died. What? “Probably go wet,” I observed. 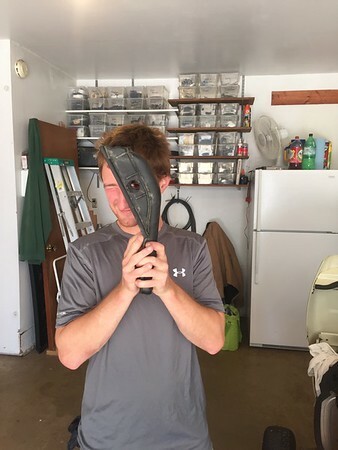 I was beginning to wonder if our air box modifications let in some water. We sat around for a while and eventually it started and it was a reason to ride even faster on the wet gravel than we had been. We blew through the second crossing and by the time we got to the dreaded third crossing we didn’t even slow down. After a while we came to a fourth crossing. What? I thought there were only three. The forth looked tough so we actually stopped and walked it, thankful for our waterproof boots. The right side was shallower but full of slippery rock with deep groves. The left side was gravel but deep. Weston went first, full blast of course, and careened through the slippery right side. I thought he might dump it but somehow righted his bike and ended up upright on the other side. Jon and I took the deep route, and it was deep. I could see Jon’s front wheel totally under water but he managed to get across. I followed right behind and immersed my front wheel as well. The Yamaha started to stall and steam was all about but I made it across without dumping into the fast running water. All the rain had really caused the rivers to run fast and deep. Tonight we are camping at Hiwasse Ocoee State Park near Delano TN, the rain stopped enough for us to set up camp and the cellular connection seems to be just enough to upload this post from the picnic table. Jon and Weston are making some progress getting a camp fire started with damp wood and spare gasoline. The internet suddenly is slowing way down so I’ll try to upload the water crossing and camp pictures in the next post. Day one is in the books, no tip overs, crashes, flats or getting lost. Having fun, Donn, Jon, Weston. You went right by Kim’s old house in TN. They used to love to ride the Dragon but I never let them take me up. LOL Have fun. Twin Peaks- HaHaHa! Same thing happened to me and Patrick once, didn’t figure it out until we got inside. I just signed on to follow your adventure. Wish I was riding with you. Enjoy your adventure.